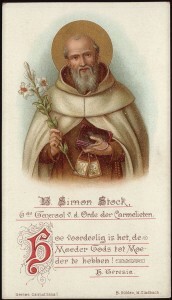 St Simon Stock is associated with the brown scapular of the Carmelite order. 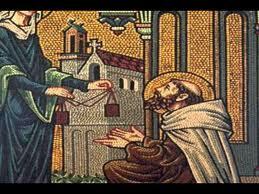 A native of Kent who may have gone on pilgrimage or crusade to the Holy Land and had an experience of the hermit and community life on Mount Carmel and brought this back to Europe and to England. Patrick Duffy tells some of the traditions about him. Little is known of the life of Simon Stock before 1247, but he may have been a native of Kent, England. Legend has it that the name “Stock” derives from his reputation that, beginning at age twelve, he lived as a hermit in the hollow tree trunk of an oak tree and practised fasting, living on herbs, roots and wild apples. He seems to have gone wandering and was on a pilgrimage (from England?) to the Holy Land, where he joined a group of pilgrims or Crusaders; these pilgrims or Crusaders gathered and lived somewhat as hermits at the well of Elijah on Mount Carmel towards the end of the 12th century. However, Carmelite spirituality and art especially likes to evoke this ancient figure of Elijah and his struggle with the Canaanite gods of Baal. When the Saracens made it impossible for that group to stay in the Holy Land, they moved via Cyprus and Sicily to Europe and eventually to Aylesford, Kent, England. In 1254 Simon was elected their superior-general in London. In the moving process they transformed themselves into mendicant friars and founded houses especially in university towns like Oxford and Cambridge in England, Paris in France and Bologna in Italy. In 1271 the first Carmelites arrived in Ireland and settled at Leighlinbridge, Co Carlow, by the River Barrow. They also founded houses in Spain. Simon died at Bourdeaux in France. Never formally canonised, his feast was approved for the Carmelite Order in 1564. Simon’s relics were brought from Bourdeaux, where he died, to his home at Aylesford in 1951. In art he is depicted as an old man in the Carmelite habit, or receiving the scapular from Our Lady.